File or folder attributes change. File or folder size change. When any of these changes are detected you have the option to trigger a program or script. 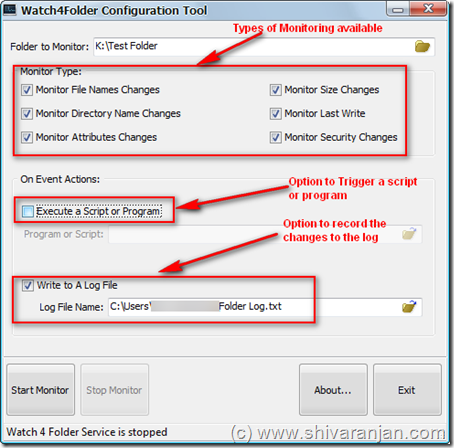 All the monitoring of a folder can also be logged in a log file. This software needs some improvement to enhance its effectiveness, the author should consider the option of logging the detailed change that occurred to the folder, an option to display a popup window when change happens and option to monitor multiple folders. We tested this software in Windows XP and Windows Vista.